The release of a new browser these days is more likely to elicit yawns than zeal, but Amazon changed that with the release of Silk for its new Fire tablet. While the fundamental idea of splitting a browser's functions between a mobile device and the cloud has been tried by others, most notably Opera, the Internet's largest retailer has taken that idea to a new scale. Giving Silk that kind of dual personality has many benefits, but there are some drawbacks, too. Here are some pros and cons about the browser. Because much of the work of rendering web pages is done in the cloud, Silk can perform faster than your typical mobile browser. With some web pages requiring access to multiple domains and downloading of hundreds of files, handing that task off to the much more powerful computers in Amazon's Elastic Compute Cloud (EC2) frees up computing resources and bandwidth that would otherwise be consumed locally on your tablet. Rendering pages in the cloud also allows the size of the browser cache on the Fire to be reduced. That saves storage space, always a good idea on mobile devices which typically have storage constraints. Silk keeps its connection to Amazon's cloud always open. That reduces latency -- the time lag between issuing a command and a function being completed -- when you launch the browser and begin surfing the web. Tying Silk to the cloud also allows Amazon to use its predictive technologies to guess what web pages you'll be asking for before you ask for them. That can speed up performance, too. Having Amazon's cloud acting as a middleman between a user and the Internet raises obvious questions about privacy. If you worry about Facebook tracking your activity on any web page containing a "like" button, your anxiety levels should skyrocket at the prospect of Amazon tracking your every move on the Web. Amazon says the information it gathers will be kept anonymous, but are you willing to gamble that it will remain anonymous when some government agency, either domestic or foreign, or some lawyer with a discovery order shows up on Amazon's doorstep demanding to look at the data? 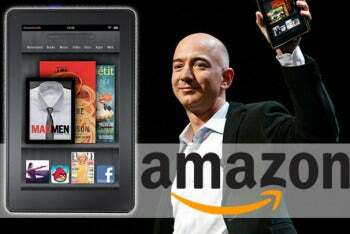 Amazon CEO Jeff Bezos wields a Kindle Fire. Security is also an issue in Silk. Because you're always interacting with Amazon's cloud, you're never directly interacting with secure websites. So when you log into your bank, for example, that information is given to Amazon, which conveys it to your financial institution. Do you really want Amazon sitting between you and your money? To Amazon's credit, it allows you to turn off Silk's cloud features and use it like a typical browser. That would address the privacy and security problems that could arise from using the software, but then you'll lose all the advantages of processing browser activity in the cloud. Another problem with not receiving content directly from a website is that you don't know how long it took Amazon to configure the content it sends to you, or, in the case of cached pages, how long they may have been sitting in the cloud. In addition, there may be times when you don't want compressed content from a website. You may want the 3MB photo served up by the site and not the 30KB version EC2 sends to you. Finally, proliferation of the Silk approach to browsing could pose problems for all web surfers in the future. If major browser makers with cloud clout decide to adopt the Silk model, not only will Amazon know your every move on the Web, but so will Google, Apple and Microsoft.